Michael Lee Aday , better known by his stage name, Meat Loaf, is an American hard rock musician and actor. He is noted for the Bat Out of Hell album trilogy consisting of Bat Out of Hell, Bat Out of Hell II: Back Into Hell and Bat Out of Hell III: The Monster is Loose. Bat Out of Hell has sold more than 43 million copies. After more than 30 years, it still sells an estimated 200,000 copies annually and stayed on the charts for over nine years, making it one of the best selling albums of all time. 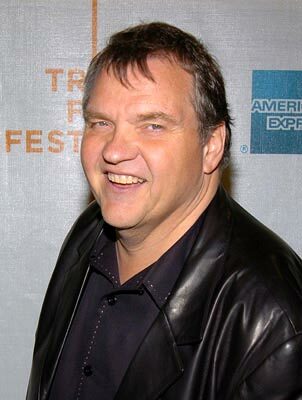 Although he enjoyed success with Bat Out of Hell and Bat Out of Hell II: Back Into Hell and earned a Grammy Award for Best Rock Vocal Performance, Solo for the song "I'd Do Anything For Love (But I Won't Do That)" on the latter album, Meat Loaf experienced some initial difficulty establishing a steady career within his native US. However, he has retained iconic status and popularity in Europe, especially the UK, where he ranks 23rd for the number of weeks overall spent on the charts. He ranked 96th on VH1's "100 Greatest Artists of Hard Rock". Meat Loaf has also appeared in over 50 movies or television shows, sometimes as himself or as characters resembling his stage persona. His most notable roles include Eddie in the American premiere of The Rocky Horror Show and The Rocky Horror Picture Show and Robert "Bob" Paulson in Fight Club. Meat Loaf was born Marvin Lee Aday in Dallas, Texas. He was the first child of Wilma Artie (née Hukel), a school teacher and a member of the Vo-di-o-do Girls gospel quartet, and Orvis Wesley Aday, a police officer. His father was an alcoholic who would go on drinking binges for days at a time. Marvin and his mother would drive around to all the bars in Dallas, looking for Orvis to take him home. Because of this, Marvin often stayed with his grandmother, Charlsee Norrod. Meat Loaf relates a story in his autobiography, To Hell and Back, about how he, a friend, and his friend's father drove out to Love Field to watch John F. Kennedy land. After watching him leave the airport, they went to Market Hall, which was on Kennedy's parade route. On the way they heard that Kennedy had been shot, so they headed to Parkland Hospital, where they saw Jackie Kennedy get out of the car and Governor John Connally get pulled out, although they never saw the president taken out. In 1965, Marvin graduated from Thomas Jefferson High School, having already started his acting career via school productions such as Where's Charley? and The Music Man. After attending college at Lubbock Christian College, he transferred to North Texas State University . After Marvin received his inheritance from his mother's death, he rented an apartment in Dallas and isolated himself for three and a half months. Eventually a friend found him. Marvin bought a car and drove to California. In Los Angeles, Marvin formed his first band, "Meat Loaf Soul". During the recording of their first song, he hit a note so high that he managed to blow a fuse on the recording monitor. He was immediately offered three recording contracts, which he turned down. Meat Loaf Soul's first gig was in Huntington Beach at the Cave, opening for Them, Van Morrison's band. While performing their cover of the Howlin' Wolf song "Smokestack Lightning," the smoke machine they used made too much smoke and the club had to be cleared out. Later, the band was the opening act at Cal State Northridge for Renaissance, Taj Mahal and Janis Joplin. The band then underwent several changes of lead guitar, changing the name of the band each time. The new names included Popcorn Blizzard and Floating Circus. As Floating Circus, they opened for The Who, The Fugs, The Stooges, MC5, Grateful Dead, and The Grease Band. Their regional success led them to release a single, "Once Upon a Time," backed with "Hello." Meat Loaf joined the Los Angeles production of Hair. During an interview with New Zealand radio station ZM, Meat Loaf stated that the biggest life struggle he had to overcome was not being taken seriously in the music industry. He compared his treatment to that of a "circus clown". With the publicity generated from Hair, Meat Loaf was invited to record with Motown. They suggested he do a duet with Shaun "Stoney" Murphy, who had performed with him in Hair, to which he agreed. The Motown production team in charge of the album wrote and selected the songs while Meat Loaf and Stoney came in only to lay down their vocals. The album, titled Stoney & Meatloaf , was completed in the summer of 1971 and released in September of that year. A single released in advance of the album, What You See Is What You Get, reached number thirty six on the R&B charts and seventy-one on the Billboard Hot 100 chart. To support their album, Meat Loaf and Stoney toured with Jake Wade and the Soul Searchers, opening up for Richie Havens, The Who, The Stooges, Bob Seger, Alice Cooper and Rare Earth. Meat Loaf left soon after Motown replaced his and Stoney's vocals from the one song he liked, "Who Is the Leader of the People?" with new vocals by Edwin Starr. The album has been re-released after Meat Loaf's success, with Stoney's vocals removed. Meat Loaf's version of "Who Is the Leader of the People?" was released, but the album failed. After the tour, Meat Loaf rejoined the cast of Hair, this time on Broadway. After he hired an agent, he auditioned for the Public Theater's production of More Than You Deserve. It was during the audition that Meat Loaf first met his future collaborator Jim Steinman. He sang a former Stoney and Meatloaf favorite of his, "(I'd Love to Be) As Heavy as Jesus" (On VH1 Storytellers, Meat Loaf shares his first introduction with Jim Steinman. Meat would revive Steinman's reaction to his intimate audience, "Well, I think you're heavy as two Jesuses to be a matter of fact! "), and with that, got the part of Rabbit, a maniac that blows up his fellow soldiers so they can "go home." Also in the show were Ron Silver and Fred Gwynne. After it closed, he appeared in As You Like It with Raúl Juliá and Mary Beth Hurt. He recorded a single of "More Than You Deserve" and had a cover of "In the Presence of the Lord" as its B-side. He was only able to save three copies of it because the record company would not allow its press release. With those three copies he released many rare CDs featuring the two songs, which can occasionally be spotted at CD outlets. He later recorded it again in a slightly rougher voice. During the winter of 1973, after returning from a short production of Rainbow in New York in Washington, D.C., Meat Loaf received a call asking him to be in The Rocky Horror Show asking him to play the parts of Eddie and Dr. Everett Scott. The success of the play led to the filming of The Rocky Horror Picture Show where Meat Loaf played only Eddie, a decision he has said he felt was "a huge mistake." About the same time, Meat Loaf and Jim Steinman started work on Bat out of Hell. Meat Loaf convinced Epic Records to shoot videos for four songs, "Bat Out Of Hell," "Paradise by the Dashboard Light," "You Took the Words Right out of My Mouth" and "Two out of Three Ain't Bad." He then convinced Lou Adler, the producer of Rocky Horror, to run the "Paradise" video as a trailer to the movie. Meat Loaf's final show in New York was Gower Champion's Rockabye Hamlet, a Hamlet musical. It closed two weeks into its initial run. Meat would later return occasionally to perform Hot Patootie for a special Rocky Horror reunion or convention and rarely at his own live shows . During his recording of the soundtrack for Rocky Horror, Meat Loaf recorded two more songs: "Stand By Me" , and "Clap Your Hands." They remained unreleased until 1984, when they appeared as B-sides to the "Nowhere Fast" single. In 1976, Meat Loaf recorded lead vocals for Ted Nugent's Free-for-All album when regular Nugent lead vocalist Derek St. Holmes quit the band. Meat Loaf sang lead on five of the album's nine tracks. In 1984 Meat Loaf changed his first name to Michael. Meat Loaf is a registered Republican. Meat Loaf is a supporter of the northern English football team Hartlepool United and, in 2003, the BBC reported he was seeking a residence in the nearby area. Meat Loaf currently resides just outside of Calabasas, California, near Saddle Peak and Calabasas Peak. He also does a considerable amount of charity work, and in June 2008, he took part in a football penalty shootout competition on behalf of two cancer charities in Newcastle upon Tyne in the UK. He auctioned shots to the 100 highest bidders and then took his place between the goal posts. He also participates in celebrity golf tournaments. In December 1978, he went to Woodstock to work with Steinman. It was at the Bearsville studio that Meat Loaf met his future wife, Leslie G. Edmonds; they were married within a month. Leslie had a daughter from a previous marriage, Pearl . Aday and his family moved to Stamford, Connecticut in 1979. In 1981, Leslie gave birth to Amanda Aday, now a television actress. For a brief time after Amanda's birth, they moved to nearby Westport. According to Meat Loaf, Pearl, then in the fifth grade, came home crying "because she had the wrong type of jeans and I said, 'That's it. We're gone.'" The family then moved to Redding, Connecticut, "which is much more of a blue-collar, working-class kind of town, and it really didn't make any difference what kind of jeans you were wearing. I really liked it there." Meat Loaf coached children's baseball or softball in each of the Connecticut towns in which he lived. In 1998, Meat Loaf relocated to California. Meat and Leslie divorced in 2001. Meat Loaf is said to have cheated death on numerous occasions, crashing in a car which rolled over, being struck on the head with a shot during a shot put event, jumping off a stage during a concert and breaking both of his legs, and being afflicted with Wolff–Parkinson–White syndrome. In October 2006, his private jet had to make an emergency landing at London's Stansted Airport after his plane's forward landing gear failed. Meat Loaf also fainted on stage while performing in Pittsburgh. Whole or part of the information contained in this card come from the Wikipedia article "Meat Loaf", licensed under CC-BY-SA full list of contributors here.